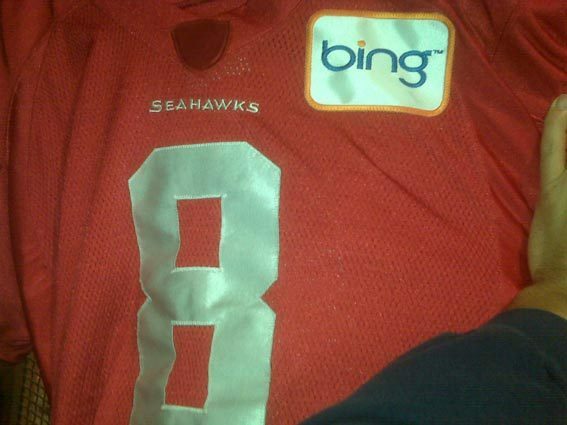 Microsoft’s Bing search engine is sponsoring the Seattle Seahawks, according to photo comes from Quarterback Matt Hasselback, who posted a Twitpic of his own practice jersey with the Bing patch on his Twitter. In a separate tweet, Hasselbeck gave the underdog Microsoft search engine a plug: “For the record— big fan of Bing.com,” Then: “…. And I like Nascar—- and Ricky Bobby,” “Maybe I can do a giveaway contest of my first “Bing” Seahawks practice jersey? I’ll ask the team if that’s cool, he wrote, Seattle Times.